We are at war. We always have been. Not a literal war – but an intellectual war of ideals; a religious war of beliefs; a cultural war of acceptability and respectability; an economic war of haves vs. have-nots. We are all fighting for our side to win. For some, a win is reaching the mountaintop and staying there. For others, a win is simply getting out of the valley of the shadow of death. Either way, we’re all fighting to ascend. To be elevated is to be in constant battle with the forces of nature be it the earth’s gravitational pull or the forces of evil – there’s always something or someone waiting to knock us down. Rev. Dr. Martin Luther King Jr. understood the art of war. He understood the adversarial relationship between good and evil and he understood that to be a proponent of justice – incessantly met by the resistance of the opposition – would possibly be to sacrifice life itself. Yet he committed his life to be a guardian of peace, a drum major for Justice, a general in the fight for racial reconciliation – standing firm in his faith, being courageous, being strong (1 Cor 16:13-14). And he fought, to his death. He died on the battlefield for a dream that we would one day live in a nation where we would not be judged by the color of our skin but by the content of our character. And today, on what would have been Dr. King’s 88th birthday, I sometimes wonder if he died in vain? I wonder because as a young black man in America, I can’t breathe. I can’t swim. I can’t drive. I can’t walk on the sidewalk at night or down the street during the day. I can’t play outside with a toy gun or inside where they are sold, I can’t listen to music too loud and I can’t even pray. And so I wonder; I wonder where it’s safe to be me anymore. Not outside of a convenience store selling loose cigarettes in Staten Island. Not at a swimming pool or driving in your car in Texas. Not walking down the street in Ferguson. Not at a park or inside a Wal-Mart in Ohio. Not at a gas station in your own car or walking on the sice walk in your own neighborhood in Florida. Not at church for bible study in Charleston. Not reading a book while waiting for your son to get off the school bus in Charlotte. Not exiting the BART subway to celebrate the New Year in Oakland; and not on the balcony of the Lorraine Motel in Memphis. Yet society tells me that all I have to do be safe is get an education, speak well, wear a suit, and I’m covered. But I remind society that Dr. King was well educated, well spoken, and was killed and buried well dressed. So sometimes I wonder if his living was in vain? Dr. King died for a dream but I’m afraid it was a dream deferred; a dream not fully realized as we’ve come far by faith but not far enough. Who will be our King; our general to be on guard, to stand firm in the faith, to be courageous, to be strong on our behalf as we line up side by side shoulder to shoulder prepared to move forward in battle? Many of us believed the election of Barack Obama as the first black President of the United States was also the inauguration of a new general in the battle against injustice for all, but particularly for people of color – the 2nd coming of Dr. King, if you will. But if you know anything about the position of the presidency, you know that this was one dream that would never come to pass. And while there is mostly praise and adoration for President Obama just days before the end of his 2 term presidency, there are equal amounts of think-pieces circulating that criticize his leadership for what it did not do for people who looked like him. I reckon President Obama will be more the Liberator in Chief we’d all hoped for out of office, but whether or not you believed he’d be King 2.0 in office, it’s clear that he wasn’t. And he didn’t have to be. Dr. King isn’t coming back in the form of a black president, or a journalist of the same name, or an NFL Quarterback, and he doesn’t need to. It’s my belief that our success as a movement hinges upon our ability to lead not as individuals, but as a unified front. A unified front united by our shared humanity. Such leadership has proven to be effective as seen with the fight for marriage equality for the LGBTQI community; a movement which made positive strides despite not having a definitive identifiable leader. The success of this movement was in the collective voice of LGBTQI and allies and their ability to coalesce around pointed issues, using their strength in numbers to leverage change. But before we can move together, we have to first stay together, and before we can stay together, we have to do some difficult internal work. We have to unpack some of our cultural baggage and leave some things behind, both whites and people of color, because we can’t take everything with us. The journey is too long, the road too rough – a war not yet won. We’ve got work to do. One of my favorite analogies about racism comes from Dr. Beverly Tatum, former President of Spelman College. She describes our society as being on a moving walkway headed in the direction of oppression and racism. Some folks, likely those we consider racists, are walking or running more swiftly in that direction, but most of us are just standing. Those are non-racists. But there’s a funny thing about standing still on a moving walkway – you’re still mowing in whatever direction the walkway takes you, whether you agree with it or not. To be anti-racist, we must turn around on this walkway and run in the opposite direction. Have you ever tried to go the opposite direction on an escalator? Or better yet have you ever stepped foot on a treadmill? It’s tiring, right? The whole phenomenon of a treadmill is to force you to go against the grain. And as the exhaustion grows, it almost feels impossible to carry on. But the point of a treadmill is not to tire you; it’s to strengthen you, so that you become stronger and stronger along the journey. If we want to change our society we can’t just stand still, pointing fingers and yelling at all the racist bigots running towards an unjust society. We must, ourselves, change our direction, go against the grain, and hopefully bring some other folks with us. That’s anti-racism. Its hard, ACTIVE work, and we all have to be held accountable, both blacks and whites. While I’ve never believed that racism was for people of color to solve, I have to acknowledge that black people have played a role in enailing it. Sometimes the greatest apologists for white supremacy are black people. Nobody forgives people with more expediency than black foaks. It’s what we’ve been taught to do; but it’s been a disguised forgiveness – not as forgiveness for our sake, but for the sake of others. We forgive to set others free without having grieved properly ourselves, rendering us captives of our own despair. We give our oppressors permission to live with a clear conscience while we continue to harbor anger, resentment, and grief in unhealthy ways. Now don’t mistake this for what it is not – a “forgiveness cease and desist” mandate for black people everywhere. This is however, a plea to black folks everywhere to reform our forgiveness. Proper forgiveness is a process, one that involves prophetic grief, prophetic guilt, and prophetic relief. When black people are oppressed at the hands of the powerful and the privileged, attention is not given to the culpability of the oppressor, or to the fight of the oppressed to overcome their situation; no, attention to those at fault would require society to hold accountable those who have long been held above reproach, or even worse – highlighting the resilience and might of the oppressed would only further empower those who society has intentionally continued to render powerless. Instead, attention is given to blacks’ ability to continue to turn the other cheek almost immediately after being slapped in the face, only to be slapped again. This is not by coincidence, but by design. With that kind of history of pathological theological indoctrination, it’s not by coincidence that today’s black Christians forgive so easily. It’s by design, to continue to absolve the oppressor of any responsibility of wrongdoing and the guilt that accompanies it. The forgiveness process should involve the processing of guilt. Prophetic guilt is an impetus for contrition, and contrition is the currency for which amends are paid between each other – both oppressor and the oppressed – and to God. Our ability to not only feel regret for our actions, but to express regret is a byproduct of guilt processing. Forgiveness without due process is forgiveness absent of prophetic guilt. When black people forgive prematurely, we excuse our transgressors from penitence, subsequently inviting repeat offenses – leaving everyone stuck in a perpetual cycle of oppression. When we think about oppression, we often only think of the oppressed as being stuck and therefor, the only ones in need of liberation. But the truth is, both the oppressor and the oppressed are stuck, and their liberation is bound. Imagine someone pinned down on the ground unable to move because someone else is holding them there. Our first mind says that the one being held down is the only one in need of freedom, but the reality is, both are stuck. The oppressed can’t get up, and for that to remain true, the oppressor can’t let up. In order to end oppression, both the oppressed and the oppressor have to be liberated – bound liberation. Proper forgiveness is a lot like oppression; it requires that both be liberated in order to experience prophetic relief. Whereas with oppression, the one in need of liberation is obviously the one being pinned down, with the oppressor being the unlikely candidate in need of freedom as well. The inverse is true for black forgiveness; black forgiveness liberates the oppressor without also freeing ourselves from the confines of anger and resentment. Black forgiveness allows the oppressor to let up, but we don’t get up – continuing to be pinned to the ground by a “pathetic” grief. To quote Dr. Cornel West, “Forgiveness is not an utterance. It’s a process. We are a loving people. We’ve taught the world so much about love because we’ve been hated so.” Let our black love continue to teach the world how to love even when being hated; and let our black forgiveness be the kind of forgiveness that allows us to love our neighbor as we have first loved ourselves. See race, don’t ignore it. A common phrase I hear from White allies is, “I don’t see race; I don’t see color. I only see people.” In fact, Black America needs you to do exactly the opposite. We don’t want to be invisible. We don’t want to be neutral. We want to be Black, because our Black is beautiful, just as your White is beautiful. I believe God created us in all different shades and forms, not for us to ignore our diversity, but to celebrate it! We absolutely want you to see color but we need you to acknowledge it as equally beautiful and valuable and non-threatening as every other color. Likewise, see racial injustice, don’t ignore it. It’s not good enough to only see color; you must also see injustice against people of color. The two principles go hand and hand and one cannot be an ally without acknowledging both race, and racial injustice. So adopt a new phrase: “I absolutely see race; I absolutely see color. And I see them as being absolutely equal in beauty and in value; therefore all races should be treated as such. Hear the outcry of Black America. Listen to the stories. Hear our grievances without disagreement. Listen for understanding of what Black America needs from White allies to accompany us on this pilgrimage of racial justice. Understand what’s being heard not as an indictment of White America, but as an opportunity to reconcile the unfortunate past and present of this country, for a better brighter future. I frequently have conversations with my White brothers and sisters about the White privilege they enjoy that Black and Brown people don’t benefit from, and they often receive it as an opportunity for debate and defense. It’s not. It’s an opportunity to hear and learn of the Black lived-experience from a Black perspective, not to be challenged by unrecognized White privilege. If you aren’t willing to hear the voices of the oppressed, your deaf ears won’t absolve you of your role in oppression, your deaf ears make you an accomplice in it. Speak out against racial injustice. If racist White bigots are the loudest amongst White Americans (and they are indeed loud), the perception becomes that they speak for all of White America. Perception is reality. If we are to recognize that racism continues to be carried out by a very small minority of noisy bigots, the voices of White allies must be louder than those who continue to spew hate into the conversation. The investment of White allies to end racism in America must be larger than the investment of White bigots to continue it. My Facebook timeline should be inundated with loud, enraged White allies drowning out the noisy racists with cries of defiance, reaffirming that those hateful few do not speak for the compassionate whole. Utilize what you’ve seen and heard as tools to articulate the positive change you want to realize. In doing so, America – Black and White, will no longer be able to discern those few voices of discrimination among the many voices of liberation. Dr. King once said, “In the end, we will remember not the words of our enemies, but the silence of our friends.” We should all be so wise as to listen. See, listen, speak, and then act. Actions speak louder than words, and words without actions are meaningless. Act at ALL times of injustice, not just when it’s convenient. Black America doesn’t get to take a day off from being Black; White allies cannot take a day off from being advocates for racial justice. Act not just at rallies for Mike Brown or the next unarmed Black person to be gunned down by police. Act in your homes in the guests you invite over for dinner. Act in the schooling of your children in choosing the environment in which they learn. Act in deciding which church you will worship in. Act at your workplace where you have the authority to make decisions about personnel. Act as if your liberation is bound to that of the oppressed, because it is. Act as if your life depended on it, because it does. As long as one of us is oppressed, all of us are oppressed. Act. As we leave behind that which ways us down culturally, socially, spiritually, and take with us that which sustains us on our journey for justice together, we do so united in our common humanity which binds us. But most importantly we do so IN love and WITH love. Even in the Bible as Paul gives military like commands to the Corinthians, he ends with a different sort of command, “Do everything in love.” You see even in warfare, be it physical or spiritual, love always has the last word. Love is what makes all of our dreams come true. Love is what makes “I Have A Dream” come true. Love is what binds us. Love is why Dr. King did not die in vain. And love is the reason why we don’t have to wait 2nd coming of King to realize his dream. The leadership is in the love. “People need to know how much you care before they care how much you know.” And while good leadership can be defined by the number of followers you amass, great leadership is measured by your ability to develop and cultivate more leaders. Never has there been a moment in American history more honorable and more inspiring than the pilgrimage of men and women, children and adults, of every race, gender expression, sexual identity, class, and faith pouring into public spaces to die-in and live-out the American dream: “We hold these truths to be self-evident; that all men are created equal.” We are the leaders of the new movement, and tied by our common thread of humanity, we are better together. I think that Dr. King knew that Jesus had broken evey chain and destroyed every yoke that were keeping His people enslaved! And,that he knew that the cross and the love of God had turned the world up side down! He(Dr. King) understood that war could not be the answer, because peace and love are the real answer! 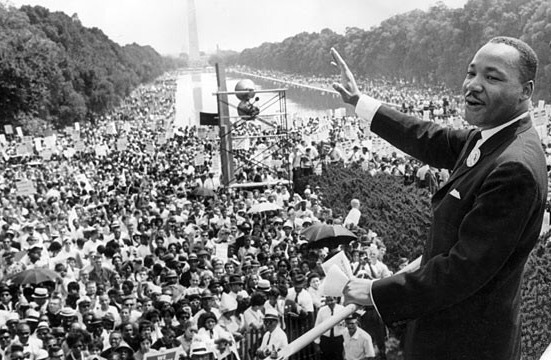 His faith in God was so strong that we can honestly say that Dr. Martin Luther King was a martyr for that faith. A very devout and “full of love” man, who KNEW that the Love of God for his childrenis that great and that powerful. Sooner or later all of us will figure out what he was telling us.